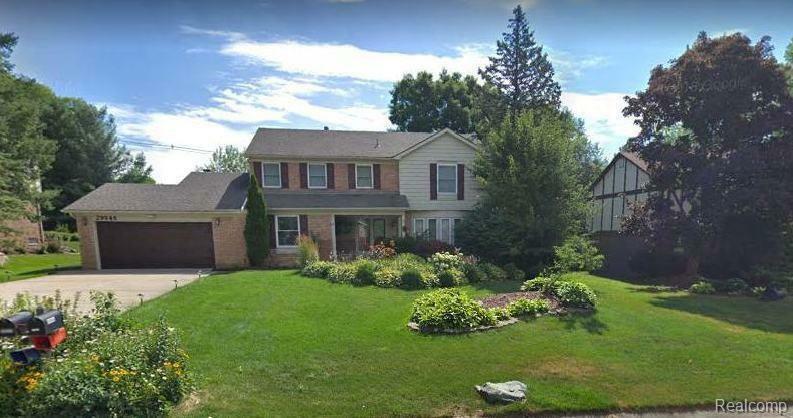 Welcome home to this gorgeous two-story colonial in Farmington Hills! 4 bedrooms, 3.5 baths, with a partially finished basement and attached two car garage. New furnace and air conditioning unit recently installed in the home. Ceramic tile foyer and stained glass entry doors; stairs to 2nd story off foyer. Large family room and dining room adjacent to foyer with bow and bay windows. 1st floor also includes a living room with gas fireplace and door wall access to the back deck. Living room opens up to kitchen and breakfast nook, which also includes a door wall that opens to the back deck. Kitchen has natural maple cabinets, granite counters and backsplash, and stainless steel appliances. Washer/dryer included. New garage door, garage door opener and wireless irrigation system. Built-in generator system (excludes generator) wired and ready for installation. Parks, paths, and commons access included with HOA, and walking distance to Forest Elementary School. Make your appointment today!! !